Tag Archives for " Jay Pitkänen "
You’ve probably run into this pop-up form more than a few times. And more than a few times, you’ve politely declined the offer. After all, why would you subscribe? You have enough spam and useless rubbish in your inbox, even without (yet another) newsletter. This is how your reader feels. They will hesitate to part with their email address without good reason. But what if your visitor wouldn’t hesitate? What if you could make your sign-up proposal irresistible? Imagine your visitor jumping at the mere chance subscribing. Your list would be full of people desperate to get more of your content. You CAN do it. All you need to do is provide value in exchange. 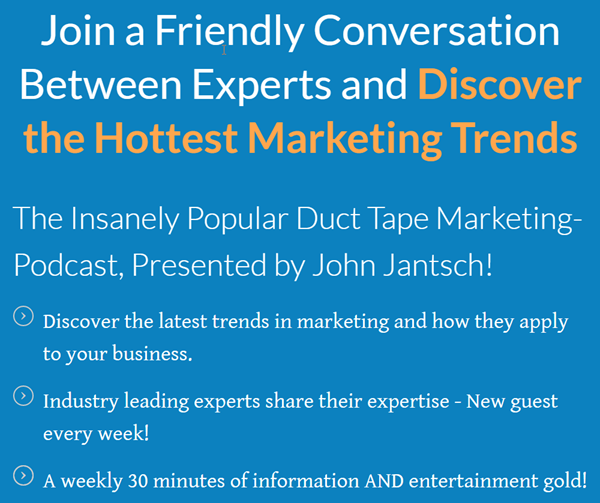 Is Your Lead Magnet Worthless? Any blog or website wanting to grow their mailing list needs a lead magnet. They’re simply irrelevant to the visitor. Your visitor is looking for information and value. If they find a lead magnet that doesn’t really promise a solution to something they’re struggling with, they will simply gloss over it and move on. Some websites try to lure people into subscribing by making wild claims about the benefits their lead magnets will provide. If your user subscribes in the hopes of receiving something truly amazing, only to be let down by a depressingly average lead magnet, they’re gone. It must provide one incredibly useful solution to one incredibly annoying problem. It needs no explaining and is quickly applied by your reader. It’s consistent with your overall message. Creating an effective lead magnet is not difficult. However, to make it memorable, you need a sprinkle of creativity. Let’s take a look at some examples of lead magnets that are creative, clever and absolutely irresistible. If your day is spent working online, you’ll love small bits of entertainment. A hilarious cat pic, a stupid (but hilarious) meme, or a brilliant quiz can provide a much needed few smiles to lighten up your day. The quiz at “The One Question” isn’t just light entertainment. It promises to help you find the purpose in your life. That’s a hefty claim, but wouldn’t you like to see what happens? 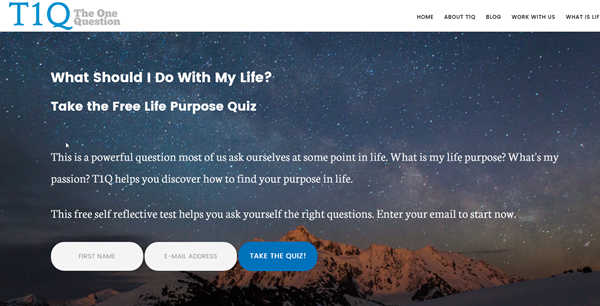 If you do, you’ll find a well-crafted quiz that perhaps doesn’t reveal your life purpose, but definitely, raises some interesting questions. Takeaway: Break the monotony of your user’s web browsing. But we can and do listen to audio. With all the audio garbage out there, some quality content to listen is always welcome. I downloaded Danielle Laporte’s lead magnet not because I’m particularly interested in the topic. I just like to have something to listen to while I’m out and about. Opted in out of practicality. How cool is that? Takeaway: Make your offer practical and easy to apply. 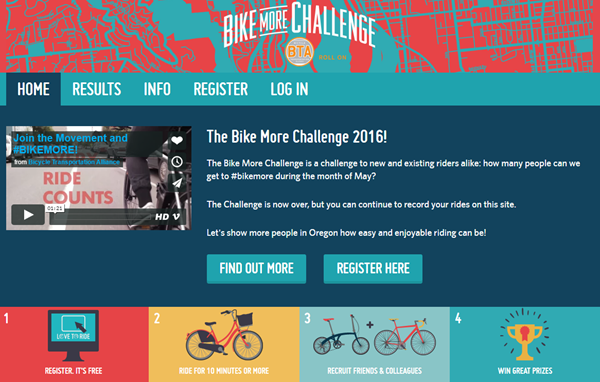 Love to Ride challenges you to ride your bicycle more. Challenges are great for engagement, but it’s difficult to follow through without peer support. That’s where the Love to Ride community comes in. Most of us start an exercise challenge excited and motivated, but soon after we lose interest and quit. With group challenges, though, you have a whole community full of similar people supporting you and sharing their daily results. It becomes a game and you find yourself riding your bike just to stay active in the group. I don’t own a bicycle, but just reading this made me want to join the crowd! Takeaway: Challenge your visitors to join a community. Case studies and reports make for fascinating reading. People are always looking for real-world examples and stories about their industry. They can also make for a great incentive to subscribe. 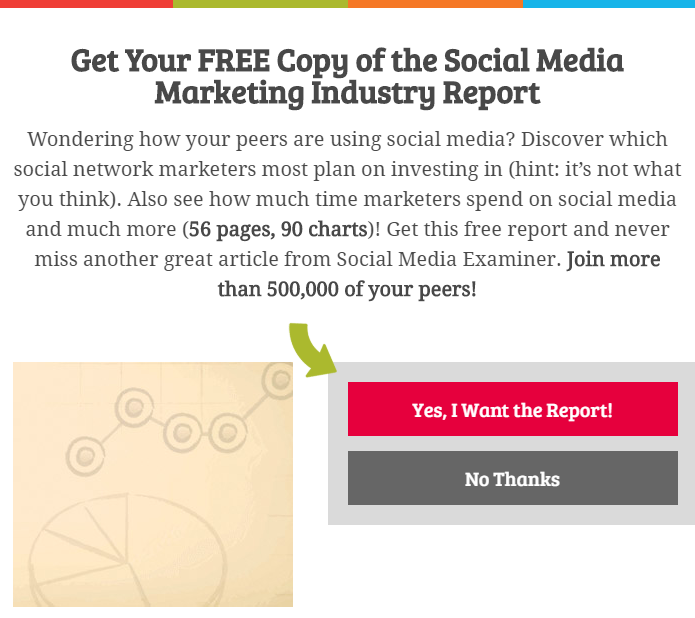 Social Media Examiner dug into the social media marketing industry and found out how marketers are using social media for their promotions. Can you offer a free version of your application or product? You might not have even noticed how common it is to use this as a lead magnet. Your visitor gets to try out your product, and you get a good list of prospective leads. Microsoft took this approach to the extreme limit by offering Windows 10 for free. Albeit with this much value, there’s a catch: Windows 10 collects much more than your email address. Toggl is a time-tracking tool with a free option for private users. In exchange for your contact information, they offer a desktop client and a way to easily track your time use. This simple tracker tool is great for immediately increasing productivity. Perhaps there’s a feature your audience is requesting. 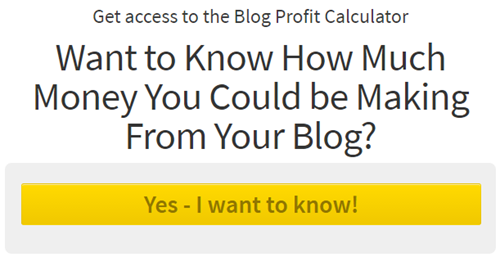 The folks at Smartblogger kept getting requests for some way to calculate blog earnings. They put together this nifty calculator. It’s a simple spreadsheet with some key figures. Takeaway: A simple tool can be a priceless time saver. You don’t need to offer a boring and worthless incentive. Make your visitor cherish their subscription from the moment they sign up. Make it memorable. Whether it be a quiz, a challenge or even an extensive report, make sure your visitor will remember it. Every opt-in offer you create needs a great landing page. 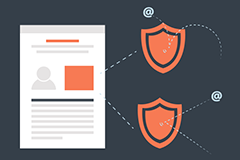 You can design your own landing pages in minutes with our RAPID method. Jay Pitkänen is passionate about copywriting, inbound marketing and turning marketing jargon into something humans can understand. When he isn’t waxing lyrical about conversion optimization on theThrive Themes blog, you can find him roaming the streets of major European cities looking for business opportunities. No, that’s not the distant sound of the discotheque down the street. That’s the sound of visitors leaving your landing page. Visitors you’ll never see again. Something on your landing page is throwing your visitors off and making them turn around. Your landing page may be hiding a conversion killer. Can you sleep peacefully, knowing that you might be driving potential customers away? Let’s put those fears to rest today. Let me show you how to find those conversion killers and turn them into conversion boosters! Your landing page is one of the most important pages on your site. It’s where a majority of your leads and sales will come from. As a result, if you make a mistake designing your landing page the effect is much more detrimental to your business than if you made the same mistake elsewhere. At Thrive Themes, we’re all about conversions. 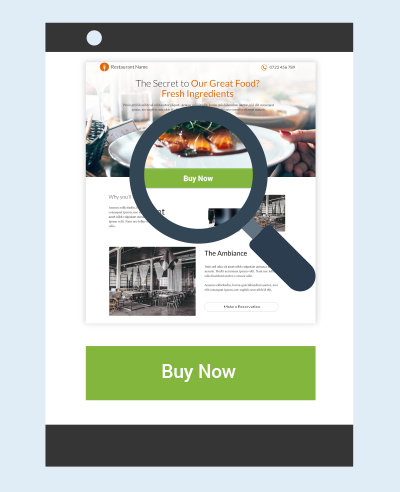 In a recent case study, we asked our audience to send us their landing pages for review and optimization. Entries came in all shapes and sizes, but a few specific and fundamental mistakes kept cropping up over and over again. Conversion Killer 1 – Why Should I Care About Your Offer? One of the biggest mistakes you can make designing your landing page is to focus entirely on describing your product or offer. When your reader first finds your content, they’re not interested in a detailed description of your offer. All they want to know is why they should stay. That’s why your landing page must illustrate the benefit of your offer. Presenting the DTM podcast in a very blunt, feature-oriented fashion. Doesn’t sound too interesting, does it? Benefit-oriented: Why should you care? Here’s the same podcast, presented in a different light. Suddenly you feel engaged as if part of a story. These examples are, of course, deliberately exaggerated. 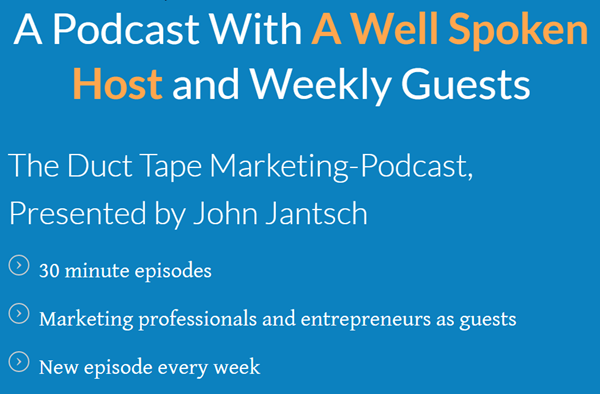 Everyone who does marketing stuff has heard of features vs. benefits, and most of us think we’re doing it right. What we’ve found is that a lot of people still make this mistake, even if to a lesser degree. In other words: Just because you’ve heard of emphasizing benefits over features doesn’t mean you aren’t making this mistake right now. Think about the questions “Why should I care” and “What is it.” With this in mind, read every paragraph and line of your landing page. See how many objects stand out on the page? You don’t know where to click. So many bright objects demanding your attention that you’ll be forced to click yourself out of there before decision paralysis kicks in. 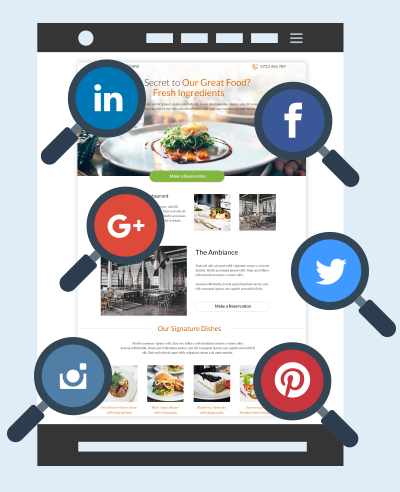 Your navigation bar, your social share buttons, and your popular content links are great elements to have on your homepage or blog page. Visitors to these pages are generally the ones who have already decided to stay and look at your content more closely. New visitors, though, they might not know who you are or what you can offer them. Your new visitor needs one single benefit to give them a reason to stay and subscribe. That’s why we design a landing page leading the visitor toward a single goal, usually a subscribe button or buy-button. Design your page with only one attractive element, brightly colored to contrast with the rest of the content. Remove any other distractions. 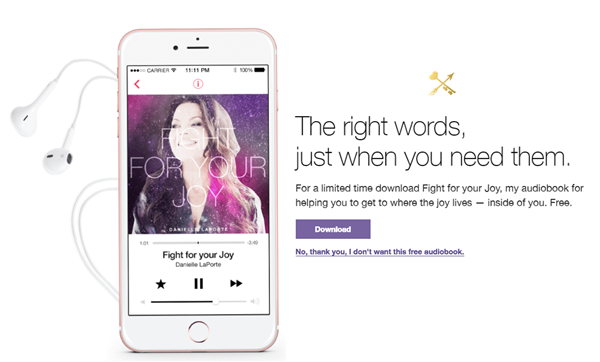 Anything that isn’t explicitly helping your conversion goal needs to go. Your sales funnel isn’t so much a collection of different elements linked together, but a solid pipeline with a single thought and purpose. If you’re designing your ads or writing your guest posts separately from your landing pages, it might lead to a disconnect in your funnel. Your ad promotes one specific offer with a specific benefit but links to your homepage. Your visitor needs to click through your navigation or look through several other offers to find the correct one. At that point, they’ll feel quite confused. Your ad is bright and colorful but leads to a landing page that’s dull and clinical. Your visitor feels they ended up in the wrong place. Your promotional ad says “Get Your Free Business Coaching Session!”, but leads to a landing page with a business coaching video. Great video, but your visitor might feel lost after expecting to sign up for a live coaching session. These sorts of things make your visitor think “Hang on, am I supposed to be here?” When you look at this from a visitor’s perspective, the problem is obvious. But how can you design your pages so that they surely keep the scent? Run through your own sales funnel. For every step, try looking at it from the perspective of someone who knows absolutely nothing about your website or business. Pro Tip: If you feel unsure about a part of your funnel, you can pinpoint the problem with tools like Hotjar. Surveys and heat mapping can be the key to reading your visitor’s mind. If you found yourself guilty of the above mishaps, you know what you need to start changing to bring in results. Remember to measure results before and after every change you make, so you know what’s working and what’s not. Let’s be honest, though. Going back to eliminate conversion killers can be exhausting. It’s much easier to design the page from the ground up with no such flaws. Check out how you can do it with our free RAPID landing page course! Silence the bounce. Sleep like a baby, knowing that your leads are safely clicking through, as they should. Jay Pitkänen is passionate about copywriting, inbound marketing and turning marketing jargon into something humans can understand. When he isn’t waxing lyrical about conversion optimization on the Thrive Themes blog, you can find him roaming the streets of major European cities looking for business opportunities.